The Sussex Police department deemed the affirmation necessary after a senior detective noted it was possible drones hadn’t flown over the airport last week, sowing confusion over the precautionary shutdowns that affected tens of thousands of passengers. “We can unequivocally state that there have been numerous illegal drone sightings at the airport over three days from 19 to 21 December,” Deputy Chief Constable Jo Shiner said. The confirmation came after Chief Detective Jason Tingley told the BBC that investigators were making progress, but also had to consider the “possibility” that people who reported seeing drones around Gatwick were mistaken. He was referring to the widely accepted limitations of eyewitness accounts. Nonetheless, the suggestion that the grounding and diversion of flights at Britain’s second-busiest airport might have been based on inaccurate information generated fresh outrage. While seeking to defuse it, the Sussex department’s Shiner said a conviction could bring whoever operated the drones a life prison sentence. “There were numerous reports clustered around 37 occasions where a drone or drones were seen, and I am keen for those responsible to be brought to justice,” she said. With London’s streets emptying of workers and last-minute shoppers, British government ministers held a Christmas Eve conference call to work on plans for keeping drones away from airports. “The huge proliferation of such devices, coupled with the challenges of deploying military countermeasures into a civilian environment, means there are no easy solutions,” Wallace said. Both the county police department and the British news received criticism Monday for their handling of the arrests and subsequent release of two people who live near the airport. Police took the couple into custody on Friday and cleared them Sunday, saying they had been cooperative and were no longer under suspicion. British newspapers published front-page photos of the man and woman and uncovered their names, which police had withheld. Speaking outside the couple’s home on Monday, Paul Gait said he and Elaine Kirk both felt “completely violated” and “deeply distressed” by the recent events. He said they were receiving medical care. 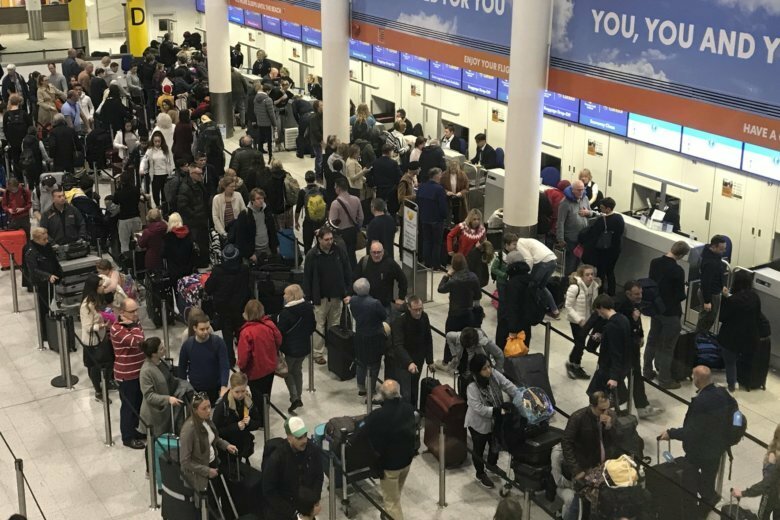 The suspension of air operations on Wednesday night, much of Thursday and Friday evening led to hundreds of canceled, delayed and diverted flights during the busy holiday season.